There’s not many guarantees in softball, but when Russo is up to bat, something amazing is bound to happen. When the team was down in Florida in early March, Russo broke the all-time hitting record with her 128th hit. “I didn’t even know I broke it because I was having tough week,” she said. She was just pleased that she was finally doing well. Russo described how she saw her dad cheer for her once she got her 128th hit. She thought he was cheering because she was finally having a good game, when in reality she had just broken a record that has stood for ten years. The record-breaking hit was a validation for Russo. It made her realize that yes, she is a good player, which was a confidence booster for her. The record had been on Russo’s mind since last season when she was told that she was close to breaking it. The team is a big focus for Russo. As the only senior and one of three upperclassmen, she acts as leader both on and off the field. “On the field you get looked to to make big plays, but off the field you’re getting looked to for advice,” she said. Russo also explained that Coach McKell Barnes, the head coach of Bates Softball, has made the program more competitive with recruiting. In doing so, girls with more experience on travel teams have come to Bates, ensuring the possibility of more record breaking hits. 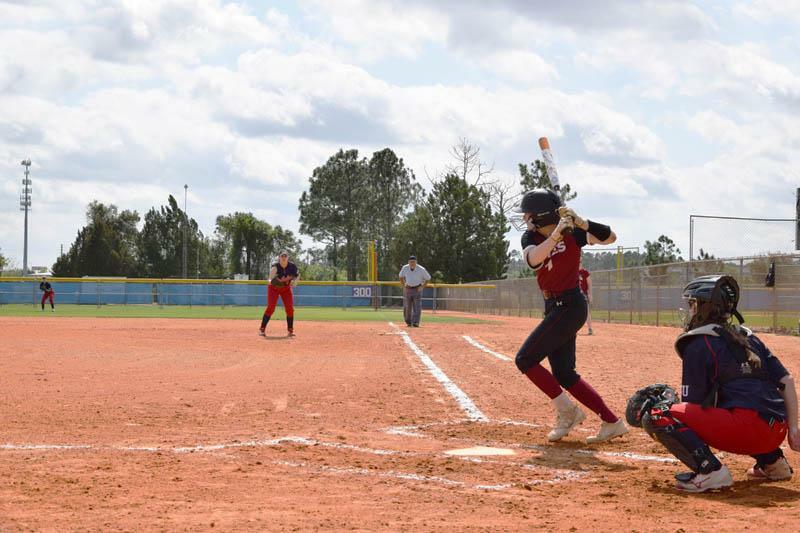 In the midst of describing what it felt like to play that day in Florida, the day where Russo would officially start her hitting legacy, she said she was “finally having a good game, [she] was comfortable, having fun [and] relaxed.” Nothing was different about that day or that game. She didn’t give herself a pep-talk about the fact that she was close to making history. She didn’t get nervous about making a mistake that would risk missing a hit, which would cause the record to escape her. No. She was calm. She was relaxed. She was enjoying what she was doing. Russo says that when she is playing she doesn’t think of much or worry about what to do. “It’s just a genuine reaction completely in the moment the only thing in my head is the cheering. It’s the best thing ever,” she said. She isn’t worried about anything else, not even the game. She’s in the moment, enjoying the sport she chose to continue in college. One could say that Russo’s experience is shared by many athletes at Bates. They wanted to continue doing the sport they loved without the pressure and stress that any failure could mean the end of their career. They chose it because of the unique friendships formed on a team where competition among teammates is healthy instead of toxic. Where academics are treated as highly if not higher than athletics. Where a team truly acts like a family. The men’s cross country team competed at the NCAA Regional Championships in Gorham, Maine on November 11 and came away with a solid fifth place finish. This is the strongest showing that Bates has had at the Regional Championships since 2013.